Original 6th plate ambrotype in full case, with separated covers. Painted gold buttons, and the gun might possibly have some light or faded brownish tinting, but I'm not positive. 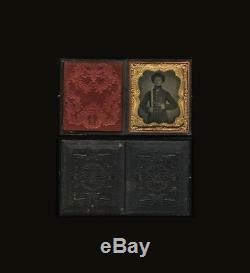 Clear glass ambrotype behind cover glass and mat, with a piece of black velvet in the case behind the image. Ambrotype is in very good antique condition with some small mat abrasions and some solarization... Looks nice under proper lighting or in daylight. 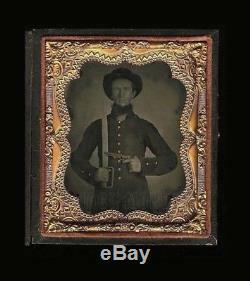 The item "Ambrotype 2x Armed Confederate Civil War Soldier Photo Bowie Knife & Gun" is in sale since Sunday, November 18, 2018. This item is in the category "Collectibles\Photographic Images\Vintage & Antique (Pre-1940)\Ambrotypes". The seller is "jack_mord" and is located in Woodinville, Washington.